When you picture a blank canvas, you picture something clean, clear and unblemished. In order for you to use your garage door for anything romantic, it needs to be thoroughly cleaned first. This includes the inside and the outside of the door. If you have a steel or aluminum door, make sure that you use the correct product for this type of material. The same goes for glass or milk glass doors. 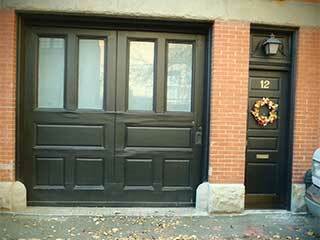 Painting your garage door can do wonders for the look and maintenance of it. As with the cleaning products, you need to ensure that you use the right type of paint for both the inside and the outside of the door. The color white is always a safe option, but you’re welcome to paint your door whatever color you like. Just make sure that the paint is completely dry before you start decorating the door. Decorating is a great way to get your creative juices flowing and there are so many things on the market when it comes to Valentine’s Day. Red and white are the obvious colors of choice, but you can go wild! The outside of your door is quite public so you would have to be completely comfortable with whatever you’re using it for. This is a great place to put a special message on the door so that when you pull up in the driveway, your loved one will see it straight away. Making use of LED lights to make pictures or special words is also a good idea. If you’re looking for a more affordable option, magnets are a great choice. You could get large ones, or even fridge magnets, to convey your special message. This option works best on steel doors. If you were hoping for something simpler, fairy lights interwoven with flowers are perfect. This is a private space so you can let your imagination run free. Place a large white sheet across the inside of the door and you have a perfect big screen. You could also place some more fairy lights around the inside of the door for some added romance. Simply set up the projector on the opposite wall and you’re good to go. Make sure that you have a wide selection of movies to choose from, as well as a comfy couch and some delicious treats and drinks. You can’t go wrong with popcorn either! The inside of the door is also a great space to use for personal messages that you’re not quite willing to share with the rest of the neighborhood. If you have a sectional door with glass panels, this tip is perfect for you. You could curl up on that comfy couch with a cup of hot cocoa and simply admire the stars outside, the perfect way to end off the perfect evening. Garage doors are tricky devices. They have many small components and use a variety of electrical parts to operate. If you’re using hanging decorations or fairy lights, please be careful and make sure that it doesn’t interfere with any of the door’s wires or cabling. Valentine’s Day is a day for happiness, not for repairing garage doors!